The Tanita UM076 body composition monitor has a 27mm (1”) black LCD with a bright white backlight that will display your weight in 100g (0.2lbs) increments, body fat % and total body water %. 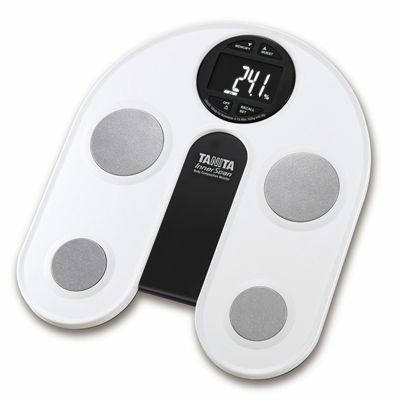 The scales offer 8 user memories, have a recall function and a weight capacity of 150kg (23st 8lbs). for submitting product information about Tanita UM076 Body Composition Monitor We aim to answer all questions within 2-3 days. for submitting product information about Tanita UM076 Body Composition Monitor. We aim to answer all questions within 2-3 days. If you provided your name and email address, we will email you as soon as the answer is published. Can these scales be used on carpet? For the most accurate results, the monitor should be placed on a hard, flat surface where there is minimal vibration. Using the monitor on carpet may reduce the accuracy of measurements. Are these scales brand new and unused? Yes, they're brand new and unused. Complete and informative instructions make this product quick and easy to adjust to using. Very satisfied with my purchase. I'm currently competing for a body building competition. I was looking forward to finding out my body fat percent. With anticipation I jumped on these scales and apparently I'm 20 percent. This is totally inaccurate due to a post evaluation at university that reports me as 8 percent. I certainly won't be advising purchase for my friends or family. Brilliant, these scales were a fantastic price & in comparison to the very high tech body monitor scales at the gym they are very accurate. Sweatband kept me informed re delivery. Cannot fault sweatband for the service or the scales. Very good price Great quality Just a bit difficult to set at first Best scales I've ever had!!!! for submitting product review about Tanita UM076 Body Composition Monitor.